A Professional grade Deep House style Ableton Template inspired by EDX, Jax Jones, Duke Dumont, Solomun among other of the top Producers of the genre and their Techniques. 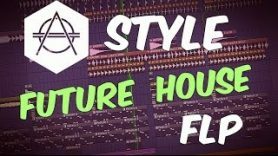 The Template was made for Ableton Live 10, using Xfer´s Serum, Reveal Sound´s Spire, Nicky Romero´s Kickstart and Izotope´s Nectar 3 Vst Plugin. Also making use of Ableton Live 10´s Stock FX and Stock Instruments as well. Deep House Style samples for beginners included, with a full arrangement Beat. Both fully Mixed and Mastered, ready for you to download and start playing it! 📌VST Plugins: Xfer´s Serum, Reveal Sound´s Spire, Nicky Romero´s Kickstart and Izotope´s Nectar 3 Vst plugin Required. 📌Drums: All Drum Samples are part of this zipped project. You can find them there. 📌Recommendations: If you run into any CPU issues, we’re using a 3rd generation Intel i7 at around 10% here so make sure to use Ableton’s freezing function and resampling techniques if you have trouble running the project. 🔊Like, Subscribe and comment below. This video “video_title” has video_views plays on Youtube. And a total of 0 Likes and 0 Dislikes at the moment. Ableton AG (founded in 1999)is a Berlin-based music software company that produces and distributes the production and performance program Ableton Live and a collection of related instruments and sample libraries, as well as their own hardware controller Ableton Push. The first version of Ableton Live was released in 2001. Nowadays exist off more than 270 people from 30 different countries divided between our headquarters in Berlin and our offices in Los Angeles and Tokyo. Ableton announced in March 2007 there collaboration with Cycling ’74, producers of Max/MSP. This collaboration is not directly based on Live or Max/MSP, but rather combines the two companies’ strengths in a new product. Ableton Live is currently in its tenth version. There are three versions of the software available for purchase: Live 10 Standard (the core software for music performance and creation), Live 10 Suite (Ableton Live, Max for Live + all of Ableton’s software instruments/effects) and Live 10 Intro (an introductory version of Live with fewer track and effect slots). Ableton Live is designed to be used with a wide range of USB and MIDI controllers, as well as instruments and virtual instruments. In January 2009 the Ableton/Cycling ’74 product “Max for Live” was announced. “Max for Live” makes it possible to create Max/MSP patches directly inside of Live. The patches act like other plug-ins in Live do, supporting preset saving, automation, and other features. It is possible to create both customized hardware plug-ins and patches as well as actions within those plug-ins that control every aspect of Live, essentially anything that can be clicked with a mouse. The company constructed the Push controller for Live 9 in cooperation with Akai Professionall.It gives access to every element within the Digital audio workstation from the one unit, playing notes on a device or instrument, sequencing melodic notes and parameters, and triggering clips via a 64 pad matrix. In 2015, Ableton released the second iteration of the Push, Ableton Push 2, which features an onboard display and better integration with the Live software. While it shows images only of Ableton Live, the information is not specific to Ableton Live. In June 2017 Ableton acquired Cycling ’74, developers of the digital signal processing environment Max/Msp and its integrated version Max for Live. In the first quarter of 2018, Ableton live10 was officially released, and the release of the new version added some new features to Ableton Push2: New melodic step sequencing layout, MIDI note view.